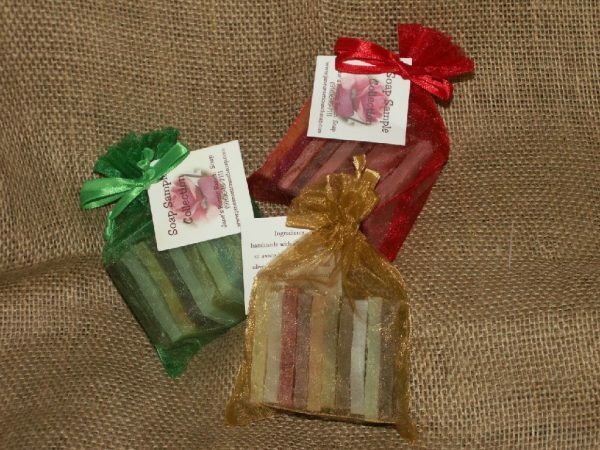 4 little soap chips in random fragrances in a small 3 in x 4 in organza bag, also in random colors. A lovely way to fragrance your sock (or whatever) drawer, car, purse, or wherever you need a little fragrance. Also great for party favors. We’ll customize the bag color and the tag for your event! Not only pretty, but functional as well. 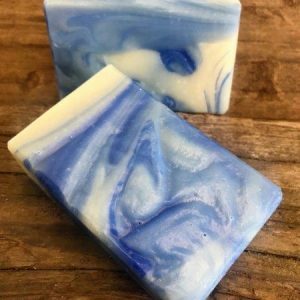 Our small soap sampler is just the ticket for wedding or party favors. 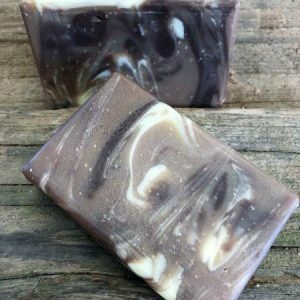 It also provides a great smell for anyplace! We left one in the car accidentally, and it smelled great! We left it there! These little samplers are also great as pop-by gifts, or just about anything you can think of. The kids like it too! Did I mention you could also take a shower with one of the chips? A special something for the Valentine in your life. $2.00 off the retail price for all these items, these gift bags are a great value. 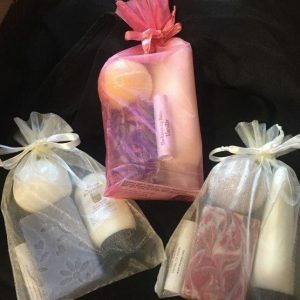 This gift bag will come with an 8 oz, 4 oz, or 2 oz lotion in Black Raspberry Vanilla, Forever Red, or Lavender in an organza bag. They also have a matching bar of soap, a bath bomb, and a lip bomb. 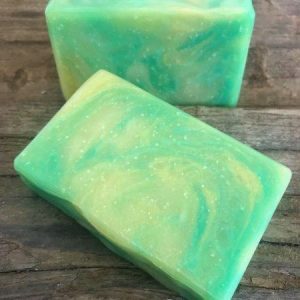 Unless specified in notes when you place your order, the soap, bath bomb, and lip balm will be our choice matching the lotion fragrance as much as possible. 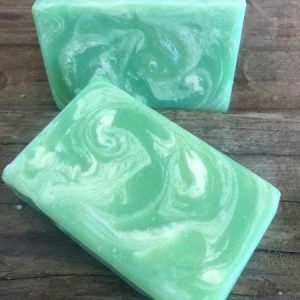 Again, if you want a different fragrance for all items except the lotion, make a note in customer notes when you order. This deal is valid through Valentine's Day. 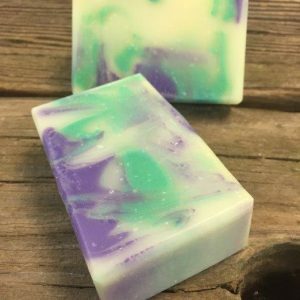 Black Raspberry Vanilla is a wonderful combination of raspberries and vanilla cream. Yummm! 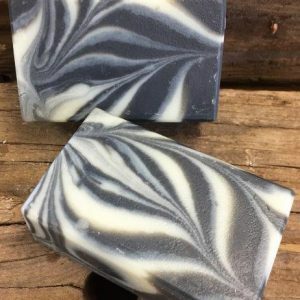 Pink, purple, and black (activated charcoal) swirl through a creamy white background. You'll love this fruity vanilla. 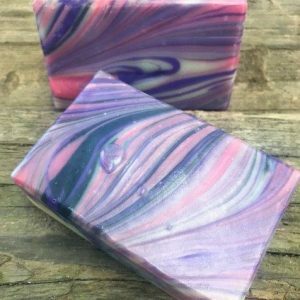 Not sure what soaps you want? 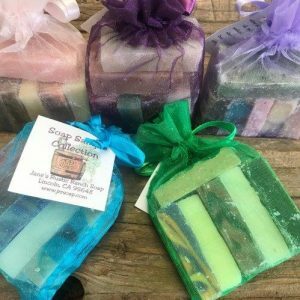 Our Large Soap Samplers are a great opportunity to experience 6 random fragrances without purchasing an entire bar of soap. (Not that that is such a bad idea!) Bag color and fragrances are randomly chosen. 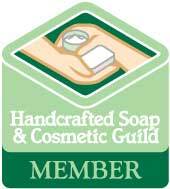 Our small soap samplers make great wedding favors. 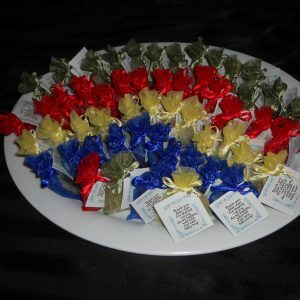 Great for any special party favor too! We'll customize the color of the bag and tag. Call for customization options, and to place an order.